From the photo I received from the French Naval Attaché in Oman, current  ensign shows in the blue fly a symbol of the Omani navy instead of the anchor. Some time ago, it has been reported that Omani naval ensign was changed: the white anchor was substituted by the Navy's logo. [Album des Pavillons 2000 shows the new badge. A fouled anchor, on which the Omani national emblem is superposed. The anchor appears only between the lower parts of the two daggers. Between the tips of the dagger, a scroll with Arabic letters. Two wreaths in the continuity of the scroll. The Sultan's crown on top of the emblem, between the upper tips of the wreaths. All elements are yellow except the main part of the crown which is red and bears in the middle the Omani national emblem in yellow. The main central emblem, lacking anchor, scroll and wreath appears at the Diwan of the Royal Court official website [broken link]. I guess it might be the Sultan's arms, somewhat different (crown with repeated national arms on it) from the national arms. Alternatively, this might some sort of greater arms, as opposed to lesser arms as depicted on the national flag. I had the chance to see and photograph the ensign of a Royal Navy of Oman vessel, the training ship Shahab Oman, during the Cutty Sark Tall Ships' Races in Bergen this weekend. As FOTW lacks an image of the Omani war ensign, I enclose a photo of the badge. As you can see, it corresponds to the above description. I asked about the meaning of the Arabic inscription, and was told by a helpful crew member that it means Royal Navy of Oman. The badge was set close to the corner of the free end of the flag. A larger photo is available upon request for those interested. A small exhibition of photographs was on display on board the Shahab Oman. One of the photos showed crew members holding the old war ensign. I took a photo of the photo, and though the quality is rather poor, the image shows clearly the shape and position of the anchor. It seems the emblem in the old ensign, the white anchor, was set centrally in the free end of the flag field, whereas the new emblem is set closer to the edges. The new Oman Navy jack is a blue flag, ratio 2:3, with red-green-red stripes and a gold crown on top of a gold anchor. Blue flag with red-green-red horizontal stripes along the centre, broken in their middle thus forming a blue rectangular patch in which there is a golden fouled anchor topped with the Omani crown. The Naval Security Force has a blue flag, ratio 5:6, with a white emblem in the middle. 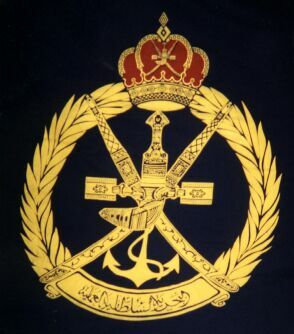 The emblem is shield-like containing two rifles in saltire, a knife and anchor and the Omani crown together with two lines of Arabic inscriptions, presumably spelling out the name of the organization. Source: Album des Pavillons 2000 [pay00].